Those black containers up there with the NFL logo don’t exactly look like they are being marketed to women. My favorite kind of flavored yogurt is one that I mix myself – take a look at The Best Brand of Yogurt You Can Buy. What it does have is real yogurt (active cultures) and 15 grams of protein per serving. Ingredients: Cultured grade A non fat milk, chicory root fiber, contains less than 1% of water, natural flavors, malic acid, stevia leaf extract, sea salt, annatto extract and beta carotene (for color), vitamin D2, sodium citrate. Notice how they ignored the 100 calorie benchmark, which I think is a good thing. Do not expect to find any fruit in these yogurts. The 7 grams of sugar is due to the naturally occurring sugar in yogurt – and since they promised no added sugar – they have only used natural flavors (instead of adding fruit which contains sugar). The peach yogurt is peach flavored without any physical peach in it. This is true for all of the Oikos flavors that I purchased. They used beta carotene (I’m guessing from carrots) to get the orange color and there were no artificial colors either. Okay, so if you aren’t freaked out that this yogurt isn’t TRULY peach yogurt then this might be for you. The sugar amount is perfect for a snack and the flavor was surprisingly good. I didn’t get a bitter aftertaste kick from the Stevia and it felt like I was eating a regular peach yogurt. I was truly surprised that I liked it - I was ready for it to taste like a chemical soup. The rest of the flavors I tried (except for the vanilla – which was a bit weird) were pretty good. If you love flavored yogurt and are looking for a low sugar option - here it is! If you want to read more yogurt reviews check out my Greek Yogurt Taste Off. Please share your thought on Triple Zero Oikos. I bought these items with my own money and have no relationship with Danone Group. Oh good! I've bought this a few times and I liked it. Glad it gets your seal of approval! I really like the salted caramel and appreciate that no artificial colors are added. I am hesitant to eat too many items with chicory root or inulin- both have laxative effects on the body. LOVE the high protein! Once again, balance or moderation in all things is important! I'm so happy you took the time to check this yogurt out. I wasn't sure about it but if it meets your approval, I'm buying some. Helpful review! A nutritionist recommended this product to me, for the protein and low sugar. I prefer the non/fruit flavors, especially vanilla (and chocolate!). Curious - has anyone used these in baking? Wow, it's a bit sad when they make fruit flavored yogurt that does not contain any fruit! Hope these are available in Canada! By the way I bought 2 of your books, one for my sister - we enjoy your humour. I liked the flavor but I found it really distressed my stomach - I am mildly lactose intolerant but this kicked it into high gear! But, my "go to" is what you have previously suggested Lisa - You can have 1 FULL CUP of plain 0% greek yogurt for 3 points (this is for Fage brand, but I think others would be the same.) And, if you add a teaspoon or two of low sugar/no sugar jam, you are just adding 1 extra point - and of course fresh fruit is free. The overnight yogurt parfait with oatmeal & chia seeds is also awesome, for around 5 points - and much bigger portion. I make mine with lots of frozen raspberries. Love it. Anytime I can find less junk ingredients and 15 grams of protein I'm happy! I do like this yogurt, glad you approve. If you want bits of fruit, you can nuke a couple frozen pieces of whatever fruit matches, dice up and there you have it. Or even fresh fruit if you have it. I haven't tried this one yet because I am looking for a plain, non-fat yogurt that has plenty of lactobacillus. I have an old yogurt maker and it requires a starter. 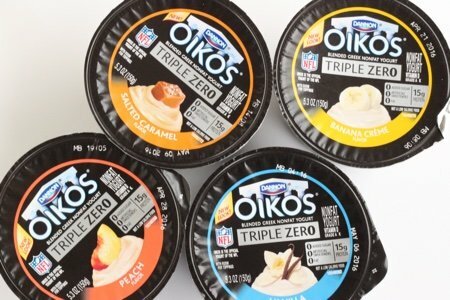 I was never a fan of Greek yogurt until I tried Oikos Triple Zero. I love it! The texture is just right. I use Stevia regularly (for Iced Tea), so I was happy to see it listed (rather than sugar or maltodextrin, etc.). The Mixed Berry is my favorite. I too have tried Oikos Triple Zero and actually like it. I'm surprised that no one has commented on the fact that this yogurt has FIBER in it along with the protein. I believe this yogurt is a good alternative for WW members and also low carbing. I usually make my own yogurt with plain greek yogurt and fruit, but this is a definite go to for me when I'm on the go. The stores by me that do sell it don't have many flavor of this yogurt, but because of the the ingredient list, I do prefer this brand when I do buy already prepared yogurt. Thank you for mentioning that it has Stevia. That's one of the things I try to avoid for various reasons (mostly the lowering of blood pressure warning from WebMD). Just to present the facts, as a ingredients chemist ( and I do not work for Dannon) chicory root fiber does not have laxative effects, however sugar alcohols ( like maltitol) do and are often found In diet product. You would have to consume 3 yogurts ( 20 grams fiber) or more in one sitting, and you " might" experience gas/ bloating. But having 20 gms of any fiber in one meal, would effect your GI tract. Straight fructose / sugar at high doses can have laxative effect, but not fiber. Chicory root fiber also is a prebiotic veggie fiber so it's helping feed any content of the probiotic cultures in the yogurt. The original six flavors are great! I really like the triple zero line. There were a few that I thought had an artificial after taste (banana and coconut if I remember correctly), but my husband liked those two flavors, so for us it's just a taste preference. Peach, strawberry and triple berry are my favorite flavors, and I like the texture. I see they also now have it in plain, which I'm looking forward to using for recipes that call for plain yogurt. Just wondering what your opinion is on chobani simply 100. Sugar is about the same but protein is a little lower. Seems all natural to me but I wanted a more educated opinion.